Hopetoun is a rural township in the Mallee region of north-west Victoria. It is on the Henty Highway and the railway line directly north of Horsham and Warracknabeal. Hopetoun came about from a settlement beside Lake Coorong, which is fed by the Yarriambiack Creek. The creek, which is a distributary of the Wimmera River that has headwaters in the Grampians, flows parallel to most of the Henty Highway and ends in the lake. The Hopetoun district was settled as a pastoral run in 1846, and in 1877 the run was acquired by Edward Lascelles. Despite the depredations of vermin and rabbits, Lascelles undertook clearing and fencing off part of his run for agricultural uses. He had farm and township blocks surveyed in 1889 and apparently persuaded the Victorian Governor, Lord Hopetoun, to visit his pastoral station in 1890. (Lascelles was a partner in the Geelong wool brokers, Dennys Lascelles). The naming of the township followed, and the first land sales occurred in 1891. Lascelles’ residence, Hopetoun House was built in 1891. Hopetoun was in Karkarooc shire, sharing council meeting venues with Beulah until a new shire hall was built in Hopetoun in 1910. Hopetoun was the terminus of the railway line until 1925, when it was extended to Patchewollock. As well as being Karkarooc’s first shire president (1896), Lascelles was a member of the Wimmera United Waterworks Trust. Water had been dammed and pumped from the Yarriambiack Creek, and in 1898 Lascelles drew attention to the prospect of harvesting water at Lake Lonsdale, in the Grampians, for supply to Warracknabeal and Hopetoun. The Lake Lonsdale catchment and channels for stock and domestic uses were completed in 1903. 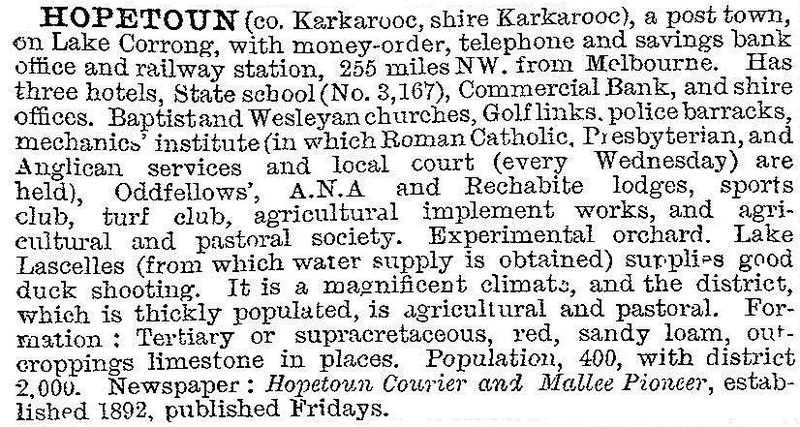 In 1910 Hopetoun had about 880 people, and in 1966 it had 1024. The steady increase of population was accompanied by increasing amenities. A private hospital became the locally owned bush nursing hospital (1943), a swimming pool was opened in 1940, a Catholic school was opened (1954) and a higher elementary school (1945) was replaced by a high school in 1960. An unusual instance of self help was the acquisition of one of Hopetoun’s two hotels in 1958 as a community cooperative venture. The 1970s saw the decline in high prices for wheat, wool and fat lambs. Farmers have diversified into chick peas and canola. Hopetoun has a branch office of the Yarriambiack shire, into which Karkarooc shire was absorbed in 1995. It is also again the railway terminus since removal of the line to Patchewollock. Educationally, there are the secondary college (120 pupils, 2014), a Catholic primary school, and an education centre and history museum at the primary school. The Hopetoun Courier newspaper reached its centenary in 1998 and continued publication. Near Lake Coorong is the smaller Lake Lascelles, adjoined by parkland, a caravan park and bowls, tennis and croquet clubs. The original Lake Coorong homestead (1854) and Hopetoun House, both on the Victorian Heritage Register, are nearby. There are a golf course, a showground, a memorial hall, a bush nursing hospital and five churches (one being Lutheran). In September 2010 and again in January 2011 many parts of regional Victoria experienced widespread severe flooding. In Hopetoun floodwaters from the Yarriambiack Creek filled Lake Coorong for the first time in 37 years.